Bouavon Vongpanya, owner of Ventura’s Tangled Lotus Floral Designs, melds her love for Palm Springs and the Pacific Coast in this beautiful inspiration shoot captured by Michelle Ramirez at the mid-century modern Capri Hotel in Ojai. Vongpanya teamed up with stylist, fashion blogger and newlywed Sarah Najafi and Dulce Dia Events to bring their modern desert vision to life. In an homage to the desert and the ocean, the color palette intertwines shades of coral, blue and matte black, softened by nuanced hues of pink and flecks of gold. Bringing the style full circle, fashion stylist Najafi chose modern takes on vintage looks for herself and her groom, Amad Ebrahimi, to reflect the events of a wedding, from the ceremony to the last look. 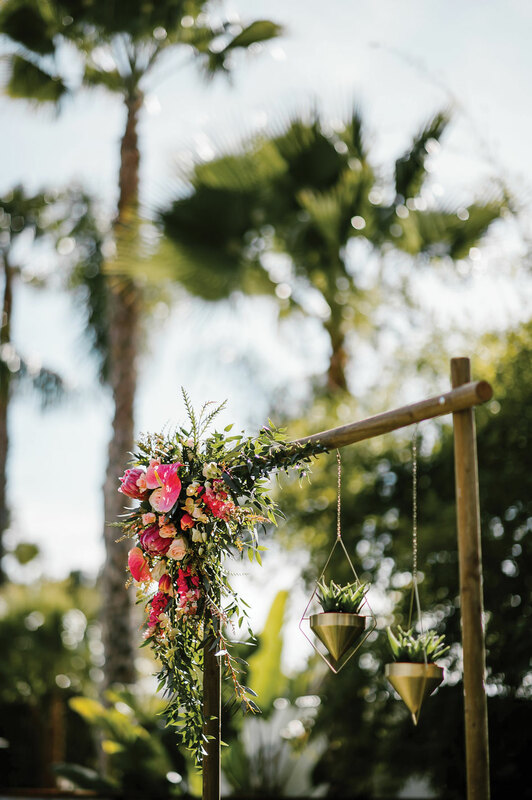 The ceremony setting features a simple wood structure embellished with a burst of blooms and geometric hanging plants. A vibrant rug serves as an aisle runner, which is bordered by potted plants. Florals by Tangled Lotus in Ventura. 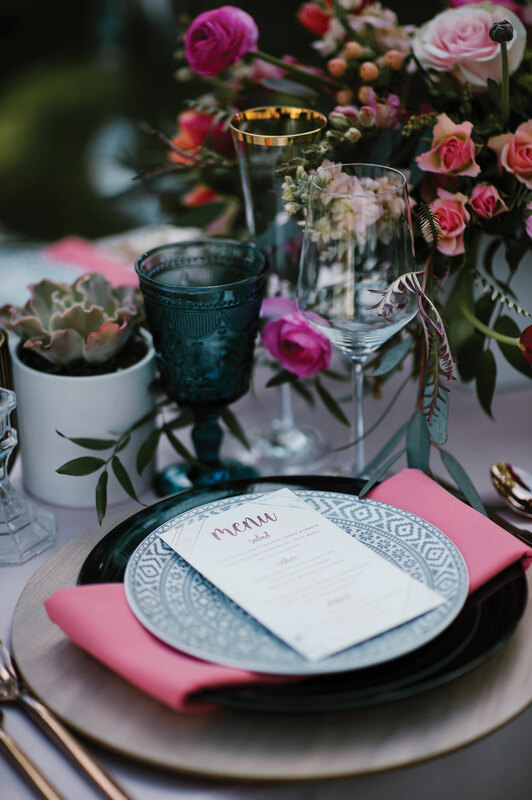 The reception table gives a subtle nod to the desert-meets-coast theme with a mix of blue and green tones in the vintage goblets and Moroccan-style dinner plates. 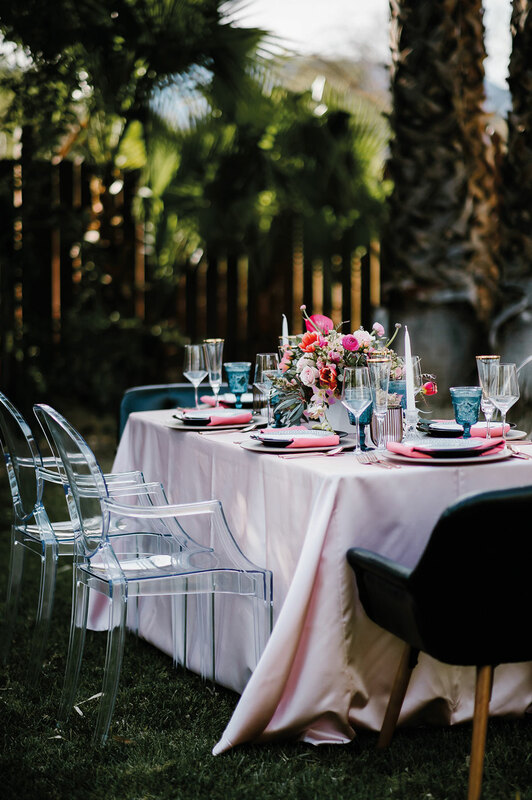 Modern touches such as potted succulents, ghost chairs, rose gold flatware and bright anthurium blooms play to the Palm Springs vibe. Rentals from Amigo Party Rentals Inc. in Ventura. Florals by Tangled Lotus. 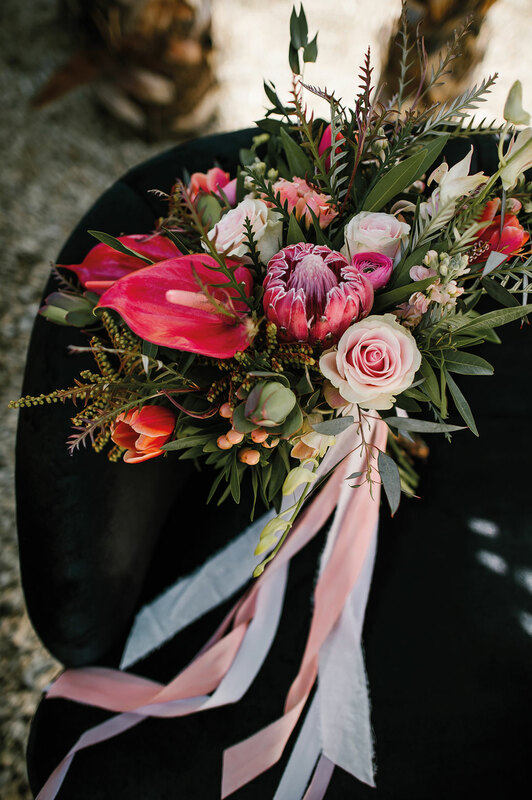 A loose, hand-tied blend of bright orange and fuchsia blooms, including anthurium, tulips and protea, nestles among soft blush and peach hypericum, dendrobium orchids and roses. Leafy greens, such as silver dollar eucalyptus, ruscus, bay and graviola leaves, add an organic note to the arrangement. An invitation suite featuring a marbled pattern framed with a rose gold retro stripe sets a retro-glam tone. The coordinating envelope mimics the marbled pattern on the liner; guests’ names and address are inscribed in smoke gray. Custom by Casie in Tustin. 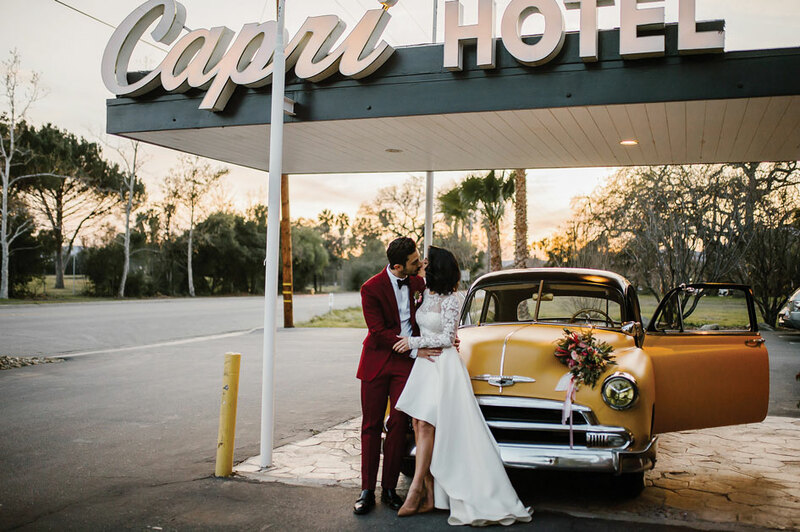 The Capri Hotel’s mod exterior and a ‘51 Chevy Business Coupe are the perfect foils for a throwback moment as the final look of the night. Ebrahimi’s red velvet suit exudes a cool retro flair, as does Najafi’s two-piece gown, composed of a lace long-sleeved top with a stunning high-low skirt. Bridal gown by BHLDN, multiple locations; Suit by Zara, multiple locations. 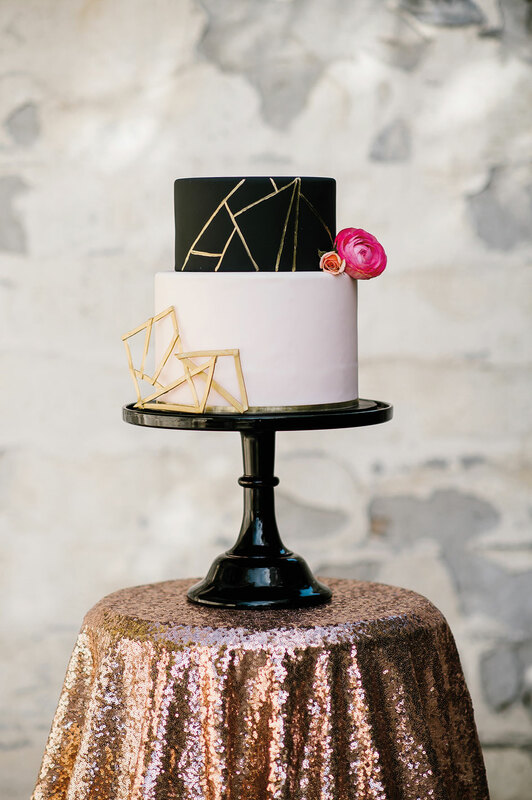 A black and white, two-tiered cake is subtly decorated with gold geometric lines and a kiss of bright pink blooms. Inside, a delicately flavored vanilla pound cake is layered with passion fruit and fresh raspberries. Delicious Artistry in Ventura. 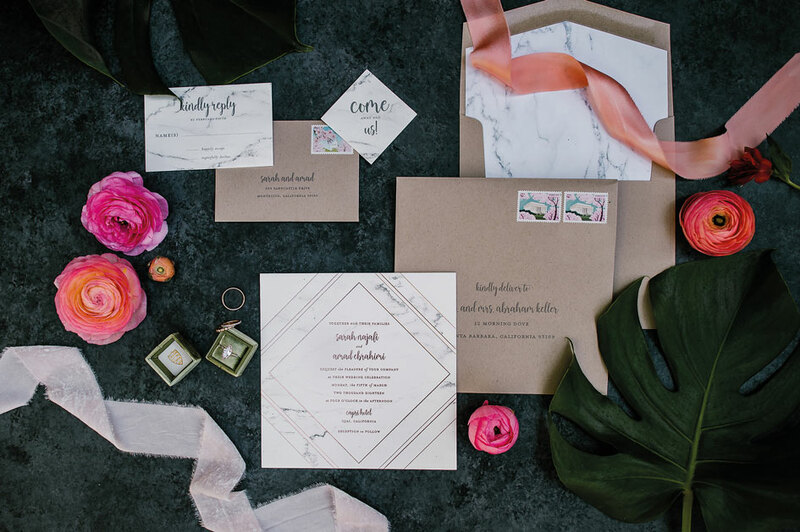 The delicate menu design by Custom by Casie reflects the invitations in its marbled pattern and rose gold stripes. Matte black plates allow the textured pink napkins to pop, and gold-rimmed champagne glasses add a touch of glamour. Rentals from Amigo Party Rentals Inc. Giving the retro theme a modern edge, Amad Ebrahimi sports a muted rose-hued suit with a black shirt. “Playing with color allows the groom to stand out in his own right,” says Najafi. Alexandra Grecco bridal gown from Lovely Bride. Hair and makeup by Brenda Hendricks Artistry in Oxnard. Suit by Zara, multiple locations.